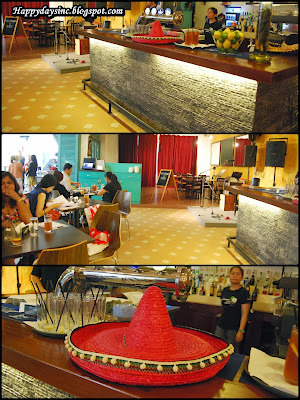 If you are looking for good Mexican food, then look no further than Frontera Sol of Mexico in Jaya One, Petaling Jaya. Frontera has a reputation for serving up authentic Mexican food in a cosy ambiance and has recently decided a menu revamp was in order to ensure that their choices remain interesting and appealing to its patrons which now include families. Besides food, the event featured clothing and jewelleries by talented local designers who have recently graduated from design schools such as Syuaida Nor, Janice Cheong, Audarya, Michelle Su and Sinyi Lum. As food was served, we were kept entertained by performers Joshua Tong and Simon Kang serenading guests out with John Mayer tunes, among other covers performed. Food was served in smaller portions than the actual dish but was no less just as good. To compensate for that, a table was set up outside the restaurant with the star dishes of the new menu in full size. Their burgers are so big that they need to jab a knife through it to make sure it doesn't fall apart. The burgers come in either fish or chicken and with Frontera's seasoned fires and jalapeno coleslaw. Below is their popular Quesadillas that is served with either grilled chicken or beef. It served with lettuce, pico de gallo and sour cream. This is particularly good for health nut given that its method of cooking does not include frying. On top of that, it looks pretty good although I didn't get to try it. Frontera's Enchiladas is very hard to resist! Look at how colourful and vibrant it is! This dish is usually served with mexican rice and refried beans and you can pick either Lamb or Mushroom and Cheese. And here was what I ordered. Crispy and Soft Taco served with either Baja-style fish or shredded duck with mango. Needless to say, this dish is far better with the soft taco as it is easier to eat. The fish too leaves much to be desired as there wasn't much meat beneath the deep fried exterior. I asked a friend though and the duck version tasted nicer due to the sweet and sourness of the mango. Finally to wrap up the entire Mexican experience is Frontera's Impossible Flan with Cajeta. Highly recommended by many bloggers, I can concur as it was delicious, moist and not too overwhelming in sweetness. So if you are looking for a Mexican spot on a lazy weekend evening, do consider Frontera Sol of Mexico. For more information, log on to www.fronterabar.com or connect to www.facebook.com/fronteraba. On a side note, kudos to the final-year Mass Communication students of IACT College for pulling off a well organized media launch. The food looks good, especially the fried rice!